Lincoln Geiger and Anthony Graham, who are two of the original three founding farmers and continue to be full-time farmers leading the dairy (Lincoln) and vegetable (Anthony) operations. 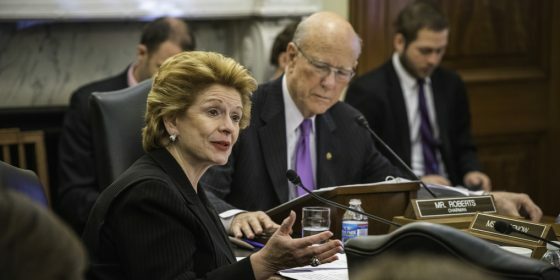 My last post described the range of challenges farmers are facing when it comes to land access, and I suggested broad solutions, like working with a land trust and fostering community support. In this post, I want to show you how those solutions can look on the ground by telling you the story of the Temple-Wilton Community Farm Project. Temple-Wilton Community Farm in Wilton, New Hampshire is one of the first Community Supported Agriculture (CSA) farms in the United States. CSAs are more than a marketing structure, they reflect a shared vision and risk and a joining together of resources and skills to provide food for a community. Many CSA farms offer shares at a fixed price that community members can purchase at the beginning of the season, affording them access to a share of the farm’s harvest on a regular basis. At Temple-Wilton, this community effort is taken one step further by estimating their expenses, sharing their budget with their members, and asking them to pledge what they can afford. For 20 years, Temple-Wilton has been operating on these principles of transparency and trust, as well as a strong commitment to the triple bottom line of farmer financial viability, sustainable land use, and strong local food systems that feed communities. It is no surprise that they brought all of these ideas to the table when confronting their land access needs. 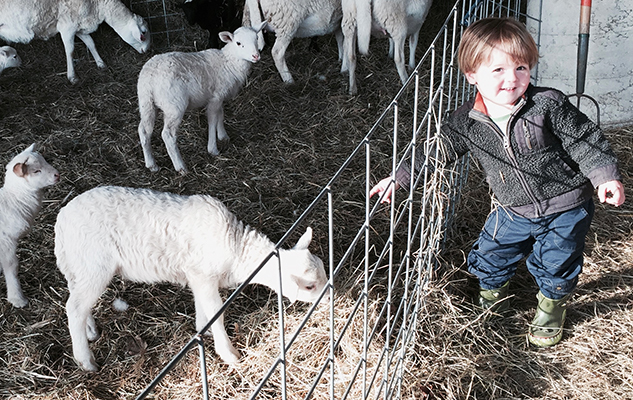 The Temple-Wilton Community Farm operates on 200+ acres of land spread across a cluster of parcels in Wilton, NH. 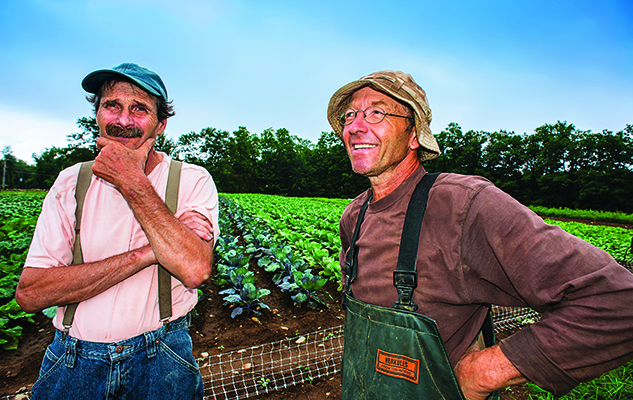 Over the past two decades, farmers Lincoln Geiger and Anthony and Glynn Graham took on personal debt to purchase parcels of farmland in the Abbot Hill area of Wilton, NH as the land came up for sale. The land then became part of the Temple-Wilton Community Farm and the farm community raised funds to help pay down debt. Additionally the farmers worked with the USDA Natural Resources Conservation Service and Town of Wilton to place a conservation easement on the land that protects it for farming. To achieve their goal of bringing the land into common ownership and ensuring that sustainable biodynamic agriculture will continue to take place on the property beyond the life of any one person, the farmers partnered with the Russell Foundation to donate the land to the Yggdrasil Land Foundation. In exchange, they received a 99-year renewable lease on the land. The farmers have built and operated their agricultural community successfully for many years. Despite all this, the 68-acre Four Corners Farm—where all of the Temple-Wilton Community Farm’s infrastructure is located—remains under a separate lease arrangement that does not provide security or equity to the farm. The landowners retain the ability to terminate the lease with little notice or cause. Given the insecurity of this arrangement and inability for the farm to build equity in this piece of land, the community has now reached a point where ownership is the security they need. 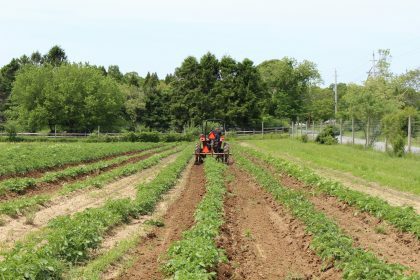 The 4 Corner’s Farm sits between two schools (Pine Hill Waldorf School and High Mowing School) and operates an after school program for 1st through 8th graders from Pine Hill as well as other local public and private schools. Land security is critical to farmers because many of the decisions that they make involve large investments and long periods of return. Whether it is building soil nutrient matter or constructing a barn, farmers need to know that they will be able to be on their property long enough to see a return on their investment.. No less important for many farmers is the ability to feel personally secure in the location where they are expending so much energy and building their life. As a practical matter, banks are rightly concerned about land security as well. Even if a young farmer did want to build infrastructure on a farm they were leasing, finding a bank to finance it might not be possible without a long-term, very secure lease. Low-interest loans: $362,000 of the $400,000 goal has been raised. Community members and organizations interested in supporting the Farm’s campaign for land security are investing $1,000 or more for a 10-year term with a 2 percent interest rate. Currently, 24 individuals and organizations have made an investment. All of their investments are provided to the NH Community Loan Fund as security for a single loan that NHCLF will provide to the farm at 2.25% interest. Creating this community lending pool to support secure land access for the farmers allows investors to be more directly connected to the farm, building on and staying true to the community-driven model the farmers have created. Gifts: a crowdsourcing campaign with a goal of $108,000 to cover the purchase price and associated costs is underway as well and currently 62 percent funded. A challenge grant from the NH Charitable Foundations will match every dollar donated. The $400,000 overall goal was determined as the amount the Farm can afford to borrow at the 2.25 percent interest rate being offered by NHCLF while continuing farming activities based on considerations of rental income, insurance, taxes, and a small building reserve. All money needs to be raised and secured by July 15, 2016 to allow a closing within the contractual deadline. A donation page with more information can be found here. 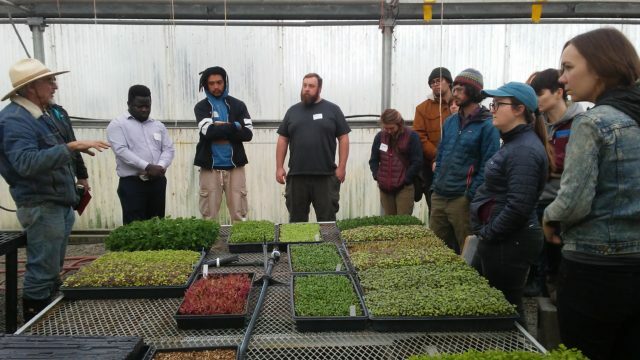 Whether it is encouraging or disheartening for you to hear that one of the oldest CSAs in the country is also struggling with secure land access, hopefully this project will be inspiring as an example of how one farm is developing solutions that are supported by and benefit the community collectively.